All transactions are safe and secure with a reliable history in online purchasing behind each of our associates. 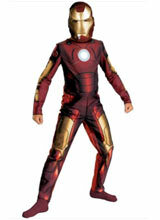 Buy the Iron Man Costumes to own Iron Man clothing and merchandise. Available in both child and adult styles, these Iron Man costumes let the wearer become their favorite armor-plated superhero. The costume on the left was inspired by the 2008 Iron Man movie starring Robert Downey Jr. and Gwyneth Paltrow, as Tony Stark and his secretary Pepper Potts. Jeff Bridges also stars as Obadiah Stane (the Iron Monger). Wear your favorite Iron Man t-shirt underneath the costume for the ultimate superhero outfit. Who knows, you just might get a call from Nick Fury. I hear that he wants another good superhero to join The Avengers. In addition to the Iron Man Costumes above, browse the Iron Man Clothing Gallery for more apparel like men's and women's clothes, kids shirts or hoodies.